Core Switch vs Normal Switch: What Is the Difference? In enterprise network, network switch is always an indispensable component. Thus locating right switches in your three-layer architecture is the first step to set up a reliable hierarchical internetworking model. As we know, there are normal access/edge layer switch, aggregation/distribution layer switch and core layer switch. In my last post – What Is Distribution Switch and Why Do We Need it? – the role of distribution switch functioning multiple switch aggregation and inter-VLAN routing has been illustrated. Today we will introduce core switch and what’s the difference between core switch vs normal switch. Core switch occupies in the topside layer of the enterprise networking (core layer), which functions as backbone switch for LAN access and centralizes multiple aggregation to the core. Since other 2 lower layers rely upon it, core layer switch must be a highly redundant and powerful layer 3 switch to ensure efficient high-speed and reliable data transmission. One feature on its hardware is that core switch is often a fiber switch to match with high-speed fiber optic cables and fiber optic transceiver modules. In the core layer, switching is ending and routing is beginning. Core switch is also equipped with layer 3 routing features, thus it kills two birds with one stone. Core switch normal port speed is at least 10Gbps to handle high traffic on the uplink. Say FS S5900-24S 24 Port 10GE SFP+ stackable managed switch. 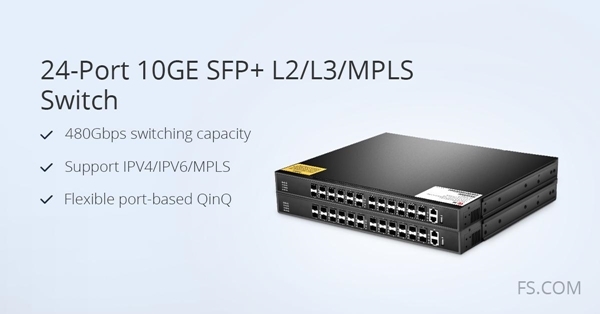 This fully managed fiber 10GbE switch supports a wide range of layer2/3, inter-VLAN routing, MPLS, QoS and many other high-end functionality, natural fit for core layer networking. The switch stacking technology allows you to control the single stack to expand network capacity. 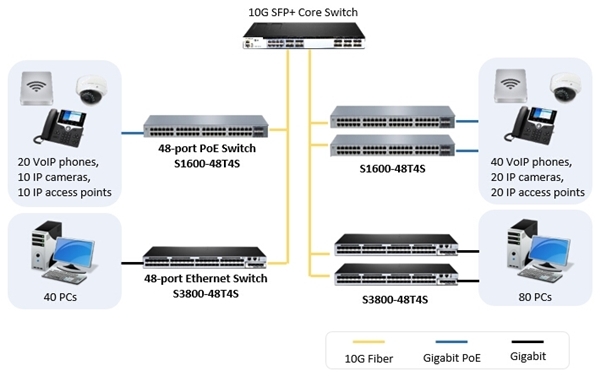 Figure 1: FS S5900-24S 24 port 10GbE fiber switch is a routing Ethernet core switch with high-performance, high-security, and switch stacking technology, expanding your network to 418Gbps. What we mentioned normal switch is often an edge switch/access switch in the access layer of enterprise network. Or in cases where network topology is not involved such as small office and home environment, normal switches may be used solely to connect end devices. Such access switch in the market often comes with copper switch with a few SFP/SFP+ port. Say S2800-24T4F fanless gigabit managed 24 port switch with 4 combo SFP slots. This quiet energy-saving access switch with abundant ports is ideal for SMBs, labs, schools and other places requiring silent operation. To provide PoE for your PDs, gigabit PoE switch is also widely used as access switch for IP surveillance cameras, VoIP phones and WAPs. Figure 2: FS recommends S2800-24T4F 24 port gigabit switch for your access layer to ensure quiet and reliable operation. Core Switch vs Edge Switch: What Is the Difference? Core switch is a powerful backbone switch in the central of the network core layer, which centralizes multiple aggregation switches to the core and implements LAN routing. Normal edge switch is in access layer to directly connect multiple end devices. What makes a best core switch? A core witch often comes with optimized hardware and software design. A remarkable feature is owning redundancy in configurations such as ports, power and PSU. A core backbone switch is also a layer 3 switch with internal firewall capability as part of its routing functionality. A normal edge switch usually doesn’t require such high demands. Actually it may even not a managed switch in simple end user connection. Figure 3: Deploying FS 10G fiber switch as core switch, gigabit PoE switches for PDs and gigabit 48 port switches as access switches. Core switch is a fatal component in enterprise network core layer, which functions both switching and routing. Compared core switch vs edge switch, core layer switch owns advanced features in hardware and software to cater for high-end applications. Though core switch price is higher than a normal switch, deploying best core switches in the core layer is a must to ensure a reliable backbone. FS provides cost-effective core switch and enterprise network solutions for different applications. Any other information to know, you can visit our official website and blog. Previous Previous post: NVGRE vs VXLAN: What’s the Difference? Next Next post: What Is InfiniBand and InfiniBand Switch?